I made these lollipop sugar cookies for my little nice’s 3rd birthday party. Although they were really fun, I wouldn’t recommend making them. The fondant swirl was a bit labor intensive..and much too sweet. 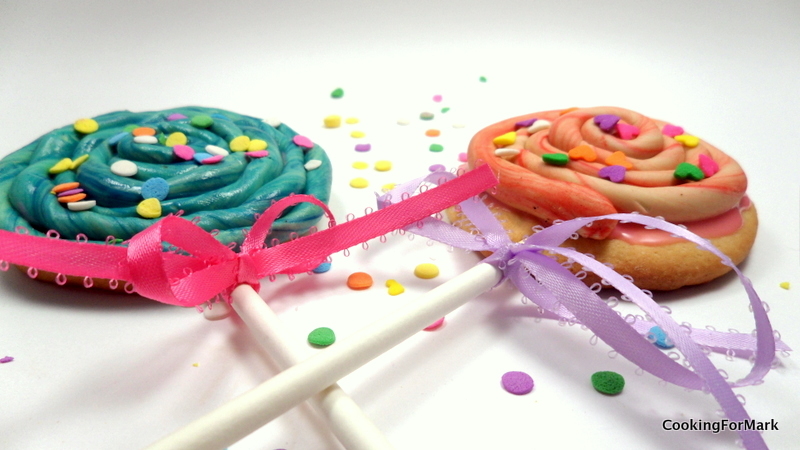 I ended up making only 3 fondant swirl cookies, and the rest were regular sugar cookie lollipops with a pink sugar glaze. Much easier and tastier too. But, I would recommend these as a project where the kids can make their own. As long as the fondant is already made (which is really not all that hard), the kids will have fun making molding and shaping their swirl cookie. Cream sugar and butter. Add vanilla. Form a ball, and place in freezer for about 30 minutes. Roll out dough on floured surface and cut round pieces. Place in baking sheet lined with parchment paper. Place a lollipop stick in the middle, and pinch sides to cover stick. Bake in preheated oven at 400 6-8 minutes. Cool completely. Add a thin layer to sugar cookie, then top with fondant swirl. Combine marshmallow, water, and vanilla in saucepan. Melt marshmallow. Place melted marshmallow in big bowl, and add 1/2 the bag of powdered sugar. Butter your hands (to prevent sticking) and knead the fondant. Add more sugar until it’s like play dough consistency. 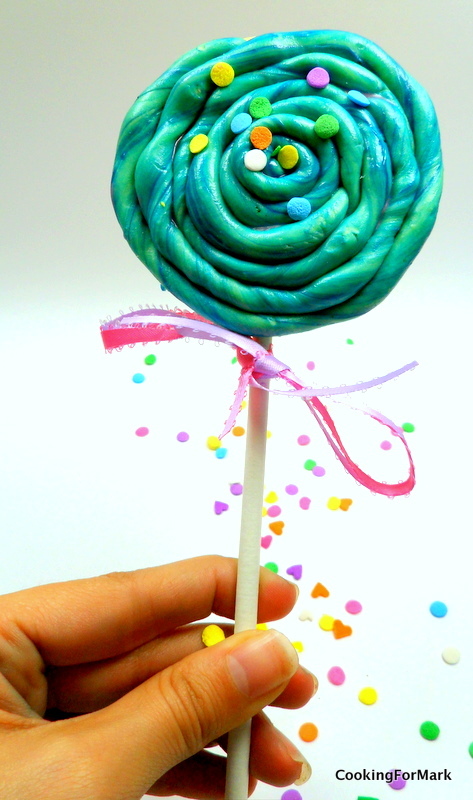 The next day, color fondant with food coloring (knead in until fully mixed), and swirl fondant over glazed cookie. This entry was posted on October 3, 2010 at 7:54 pm and is filed under Dessert, Party with tags cookies, lollipop, sugar, swirl. You can follow any responses to this entry through the RSS 2.0 feed. You can leave a response, or trackback from your own site.